We were so pleased with your portrait - our daughter was thrilled at the stunning likeness of her West Highland Terrier 'Lulu'. By simply providing Simon-Morse-Portraits with a decent snap of the subject, the process from enquiry to delivery and payment was an easy transition, so much so that we have now commissioned another portrait of our son's cat. 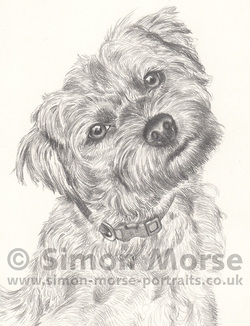 We would truly recommend Simon-Morse-Portraits. Simon has done two portraits for me now and they have both been excellent. They make the best presents! Besides being extraordinarily talented (working from just a photo), Simon is reliable and very reasonably priced. I’ve no doubt I’ll be requesting a 3rd soon! Thank you so much Simon for doing such a really great portrait of Gaye, my daughters horse. I knew I got the right present for her birthday when I saw her face this morning. I was so impressed with the portrait Simon created from a number of photos. He totally understood what I wanted and provided regular updates throughout the process. My partner was very happy with his gift. ​Simon is a gifted artist and I have recommended him to my friends and family. For the work he does, his prices are very reasonable.